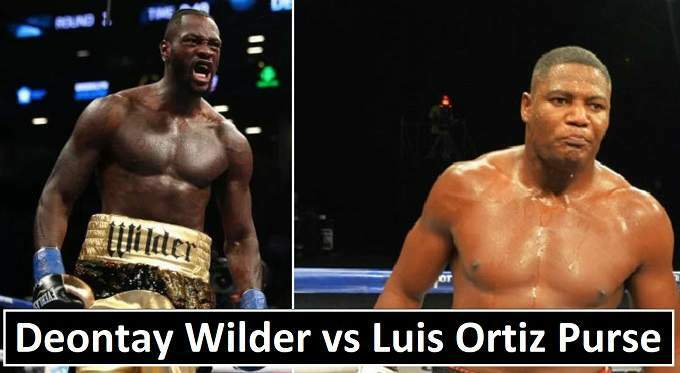 Deontay Wilder next fight will be on Saturday where he will be facing Luis Ortiz. After winning his previous fight from (Bermane Stiverne) Wilder hopeful to get fight against British boxer (Anthony Joshua). Its a great chance for Ortiz to become the new (WBC heavyweight champion) if he made biggest upset in boxing year 2018. Its the first big main event pay-per view card of 2018 in boxing. The fight take place in Barclays Center, New York, United States on 3rd March. How much purse money paid to the both boxers. if the rumors true then purse money would (60/40) in split. Deontay Wilder make big money from this fight and will earn some revenue share pay-per view high sales. After winning the WBC Heavyweight title from (Stiverne) in 2015, Wilder successfully defended it 6 times in last 3 years. Its 7th time when he will be facing a challenger for the title in start of year 2018. If Deontay Wilder retained the title there will be more chances for the mega heavyweight fight this year. Currently there is no official announcement made about how much purse money paid to Wilder. But since 2017 his earnings increased and he paid upto $5 million purse per fight. Ortiz defiantly make purse about $1 million or $1.5 million from the fight this Saturday.